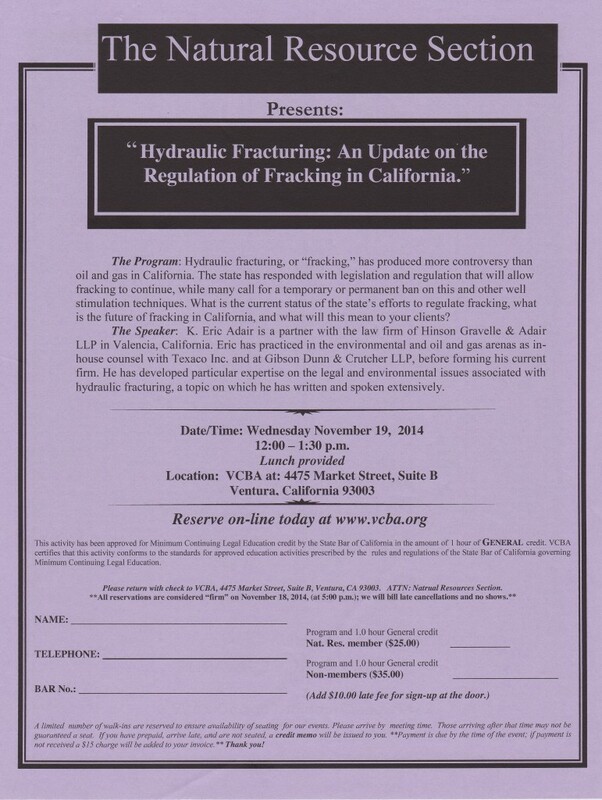 Hinson Gravelle & Adair LLP attorney Eric Adair has been invited to address the Natural Resource Section of the Ventura County Bar Association on the topic of “Hydraulic Fracturing: An Update on the Regulation of Fracking in California” on November 19, 2014. As noted in the program flyer (below), hydraulic fracturing has produced more controversy than oil and gas in California. The state has responded with legislation and regulation that will allow fracking to continue, while many call for a temporary or permanent ban on this and other well stimulation techniques. Mr. Adair will focus on the current status of the state’s efforts to regulate fracking, discuss the future of fracking in California, and offer his thoughts on what this may mean to lawyers and their clients. For more details and registration information, please visit the Ventura County Bar Association’s website.